Onodi cell or sphenoethmoidal air cell is a posterior-most ethmoidal air cell that pneumatize either superolateral, superior or lateral to sphenoid sinus. Adolf Onodi was the first to describe the presence of Onodi cell in the year 1904. Embryologically, sphenoid bone ossifies from the lower chondral ossification center and the upper ossification center merging with that of Ethmoid. Posterosuperior ethmoidal air cells may surround optic nerve, and when persist, it forms the Onodi cell. Onodi cell if present has to be detected preoperatively, because of its very proximity to optic nerve and internal carotid artery canal so as to avoid injury during sinus surgeries. Multidetector computed tomography (MDCT) plays a very important imaging modality for detection of Onodi cell and to assess their patterns of pneumatization in relation to sphenoid sinus. The study was undertaken to know the patterns of pneumatization of Onodi cell by 128 slice MDCT. A retrospective radiological study was undertaken in the Department of Radiology, JSS Medical College and Hospital, Mysore, Karnataka, India over a period of 6 months from January to June 2016. A total of 1080 peripheral nervous system studies were analyzed during the study, out of which 260 cases satisfying inclusion criteria were included. All adults of age above 18 years and of both sexes were included in the study. Posttraumatic, infective, neoplastic, and postoperative cases that distorted the normal anatomy of paranasal sinuses were excluded from the study. Axial images of paranasal sinuses were taken with Philips ingenuity 128 slice MDCT scanner (Netherland). The patient was positioned supine with head first, and axial sections were captured in helical format by fixing the tube current at 120 kVp and 117 mAs. High-resolution images were obtained with scan parameters of collimation 64 × 0.625, pitch of 0.39, field of view of 220 mm, filter at Y-sharp (YC), slice thickness of 1 mm, window centering at 200, and window width of 2000. Multiplanar reconstruction was done from axial images in a dedicated workstation to obtain coronal and sagittal images without any loss of volume data. Images were stored in hospital picture archiving and communication system and then the images were retrieved from hospital database system obtaining the inpatient number. Both sagittal and coronal planes were used to identify the presence of Onodi cell. Onodi cell was identified as a posterior most ethmoid cell that in present either superior and/or lateral to sphenoid sinus. Further on sagittal plane, Onodi cell was seen separate from the posterior group of ethmoid air cells. Their pneumatization patterns and relationship with sphenoid sinus were analyzed using coronal reformatted images. Pneumatization patterns of Onodi cell were further classified into three patterns in the present study for their easy recognition and to assess their relationship with sphenoid sinus by the following methodology. A horizontal line was drawn at the uppermost part of sphenoid sinus in coronal reformatted image at a plane where maximum size of Onodi cell was seen in contact with bony sphenoid sinus. If the cell was seen above and medial to sphenoid sinus, then it was labeled as Type I pattern of pneumatization, Type 2 if the air cell was seen both above and below the horizontal line and Type III if it was seen below the horizontal line. All the findings were reported by a single radiologist and analyzed retrospectively. All the data were entered into Microsoft Excel 2013 sheet for analysis. Categorical variables were reported as proportions. The analysis was done using SPSS version 20 (Philips health care, Netherland). 95% confidence interval (CI) values were calculated using a confidence interval calculator for proportional values. 1080 MDCT paranasal sinuses were analyzed over a period of 6 months, out of which 260 cases showed the presence of Onodi cell [Table 1]. Males constituted 163 cases (62.69%) and females 97 cases [37.31%, [Table 2]. Type I [Figure 1]a were 108 cases (41.53%, CI - 35.54–47.52), Type II [Figure 1]b and [Figure 1]c 147 cases (56.55%, CI - 50.12–62.18), and Type III [Figure 1]d five cases [1.92%, CI - 0.25–3.59, [Table 3]. Posterior ethmoid sinuses have complex anatomy, and their normal anatomical variations are frequently encountered. Onodi cell is one among the posterior ethmoid variations that need to be further evaluated because of its very proximity to optic nerve and internal carotid artery canal. Onodi cell has varying definitions that include at least one of the following criteria: Endoscopically identifiable optic canal bulge or the presence of air cell either lateral, superior or superolateral to sphenoid sinus and present in close approximation to optic nerve canal or Internal carotid artery canal. Onodi cell has to be differentiated form overriding posterior ethmoid cell because of their anatomical resemblance and both being closely related to optic nerve canal. Onodi cell is isolated air cell, that is completely separate from the posterior ethmoid air cells or sphenoid sinus, whereas overriding posterior ethmoid air cells are in continuous with that of posterior ethmoid air cells. The prevalence of Onodi cell varies according to their description and modalities used for identification. According to Driben et al., the prevalence of Onodi cell was 39% on endoscopic examination of cadavers. The prevalence was 12%, 8%, and 25% according to Arslan et al., Unal et al. and Nitinavakarn et al. respectively in their CT scan study of Onodi cell. Identification of Onodi cell is very important clinically because of its proximity to optic nerve canal. There is increased the risk of injury to the optic nerve during sphenoid sinus surgeries and may be mistaken peroperatively resulting in incomplete clearance of the sinus disease. Onodi cell mucocele or pyocele can cause retrobulbaroptic neuritis, neuropathy, or loss of vision if not treated completely. Onodi cells may interfere with surgical exposure of sellar floor and complete excision of sellar or parasellar mass lesions. Endoscopic sinus surgery has been widely accepted surgical option available for paranasal sinus diseases, and it has to be performed very safely with few complications. Anatomical variations of posterior ethmoid air cells are more common and the presence of Onodi cell in relation to optic nerve can have an increased risk of injury if adequate preoperative detection is not done. Hence, improving the preoperative identification of these Onodi cell and their pattern of pneumatization by MDCT can decrease the risk of subsequent optic nerve injury. The relationship between Onodi cell and optic nerve canal has been investigated previously and their actual prevalence varies considerably among different studies. Inconsistency in their prevalence may be due to different criteria's used to define Onodi cell or different modalities used to identify or due to racial factors. According to Yeoh and Tan, Onodi cell is more frequently present in Asian population compared to other races. The prevalence was 42% according to Kainz J et al. using endoscopic dissection for identification of Onodi cell  and 14% using endoscopic surgeries by Weinberger et al. Onodi cell has to be differentiated from overriding posterior ethmoid cell which can be coexisting in 36.8% of Onodi positive cell specimens. Posterior ethmoid cells may expand beyond the ethmoid bone into the sphenoid bone usually superolaterally and may surround optic canal simulating Onodi cell in majority of the cases. Surgical approach will change once the Onodi cell is identified and it may be seen extending up to 1.5 cm beyond the anterior surface of the sphenoid sinus. The inferomedial floor of sphenoid sinus is the preferred route to enter Onodi cell so as to avoid any injury to optic nerve. MDCT offers the best imaging tool to detect and recognize the pattern of pneumatization of Onodi cell. The advantage is multiplanar reconstruction and high-resolution bone reconstruction algorithm. Three patterns of pneumatization of Onodi cells are described in the present study with Type II (superolateral) being most common followed by Type I (superior) and Type III (Lateral). In our study, we do had a problem to differentiate Onodi cell and overriding posterior ethmoid air cell if both were coexistent. However, overriding posterior ethmoid cells did not have a complete lined bony septum, whereas Onodi cell has a completely lined bone septum which is separate from posterior ethmoid group of air cells. Systematic evaluation of paranasal sinuses by CT scan is needed to detect Onodi cell and other posterior ethmoidal air cells so as to avoid any potential complications during endoscopic sinus surgeries. Visualization of Onodi cells in all orthogonal plaines, i.e., axial, coronal and sagittal are necessary for their accurate identification and pneumatization patterns. Hoang et al. in his study showed that coronal plain is more useful than other planes for evaluation of ethmoidal sinus and its variations. However, in the current study, multiplanar reconstructions were made in all three planes and Onodi cell was analyzed for their presence and patterns of pneumatization. Analyzing these ethmoidal air cells in any single plane would result in the under or over the interpretation of Onodi cell, thus requiring multiplanar imaging modality for their accurate detection and assessment of pneumatization. Further MDCT also has an advantage of faster scanning, reconstruction algorithm for bone and soft tissue and high spatial resolution. 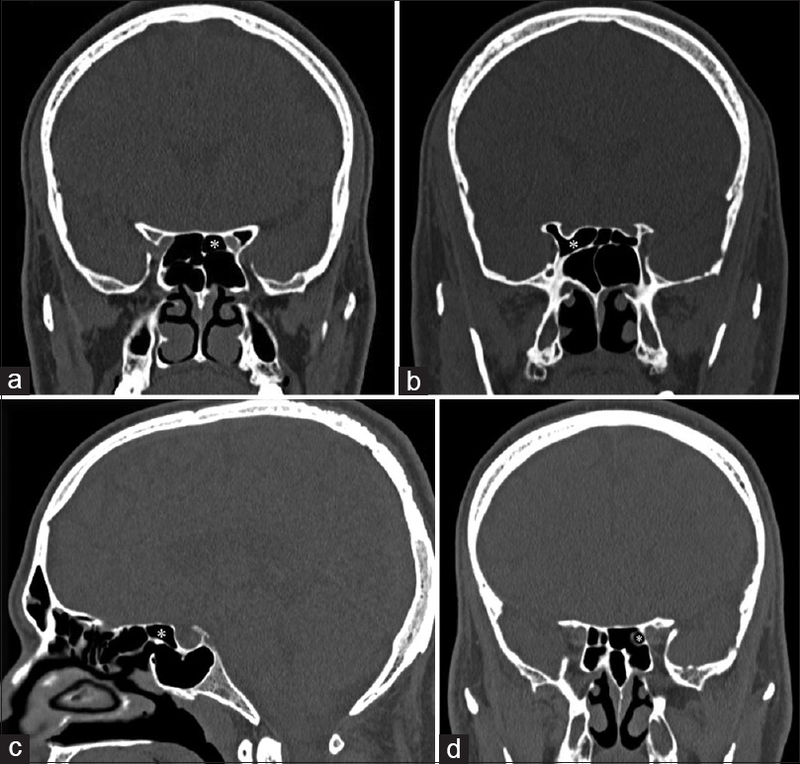 MDCT does have a limitation of radiation risk compared to other modalities, but with easy availability and noninvasiveness, MDCT can be used preoperatively to know the ethmoid sinus variations in all patients before undergoing sinonasal surgeries. Onodi cell presence and their patterns of pneumatization are very useful for operating sinus surgeons for clearing inflammatory pathology involving paranasal sinuses. Inadvertent optic nerve and internal carotid artery canal damage can be avoided during surgeries with adequate preoperative knowledge about the paranasal sinus anatomy. Type II is the most common type of Onodi pneumatization pattern when compared to other types. MDCT offers the best imaging modality for Onodi cell detection and to assess their pneumatization patterns. Stammberger HR, Kennedy DW, Anatomic Terminology Group. Paranasal sinuses: Anatomic terminology and nomenclature. Ann Otol Rhinol Laryngol Suppl 1995;167:7-16. Suat Bilici, Gulben Erdem Huq, Ahmet Volkan Sunter, Ozgur Yigit and Muhammmet Yildiz. Onodi Cell Mucocele: Case Report. Otolaryngology 2014: 4-4. Lim CC, Dillon WP, McDermott MW. Mucocele involving the anterior clinoid process: MR and CT findings. AJNR Am J Neuroradiol 1999;20:287-90. Yoon KC, Park YG, Kim HD, Lim SC. Optic neuropathy caused by a mucocele in an onodi cell. Jpn J Ophthalmol 2006;50:296-8. Tomovic S, Esmaeili A, Chan NJ, Choudhry OJ, Shukla PA, Liu JK, et al. High-resolution computed tomography analysis of the prevalence of Onodi cells. Laryngoscope 2012;122:1470-3. Driben JS, Bolger WE, Robles HA, Cable B, Zinreich SJ. The reliability of computerized tomographic detection of the Onodi (Sphenoethmoid) cell. Am J Rhinol 1998;12:105-11. Arslan H, Aydinlioǧlu A, Bozkurt M, Egeli E. Anatomic variations of the paranasal sinuses: CT examination for endoscopic sinus surgery. Auris Nasus Larynx 1999;26:39-48. Nitinavakarn B, Thanaviratananich S, Sangsilp N. Anatomical variations of the lateral nasal wall and paranasal sinuses: A CT study for endoscopic sinus surgery (ESS) in Thai patients. J Med Assoc Thai 2005;88:763-8. Chee E, Looi A. Onodi sinusitis presenting with orbital apex syndrome. Orbit 2009;28:422-4. Yanagisawa E, Weaver EM, Ashikawa R. The Onodi (sphenoethmoid) cell. Ear Nose Throat J 1998;77:578-80. Yeoh KH, Tan KK. The optic nerve in the posterior ethmoid in Asians. Acta Otolaryngol 1994;114:329-36. Kainz J, Stammberger H. Danger areas of the posterior rhinobasis. An endoscopic and anatomical-surgical study. Acta Otolaryngol 1992;112:852-61. Weinberger DG, Anand VK, Al-Rawi M, Cheng HI, Messina AV. Surgical anatomy and variations of the Onodi cell. Am J Rhinol 1996;10:365-70. Cherla DV, Tomovic S, Liu JK, Eloy JA. The central Onodi cell: A previously unreported anatomic variation. Allergy Rhinol (Providence) 2013;4:e49-51. Kim JY, Kim HJ, Kim CH, Lee JG, Yoon JH. Optic nerve injury secondary to endoscopic sinus surgery: An analysis of three cases. Yonsei Med J 2005;46:300-4. 1 Is there a relationship between Onodi cell and optic canal?